It was Hari Raya Haji holiday, so it means there is no school & no work for most of us. It was late morning and I was in the super market grabbing some ingredients to cook as lunch later when DinoAunt text me that they are going ice skating. I couldn't decide if we can go as there were lunch to be cooked and stuffs to be done. While having lunch I decided to just leave my tasks (which are endless anyway) and go out for some fun with the cousins & friends, I am sure glad that I made that decision because it proves to be a priceless play time for DinoBoy. 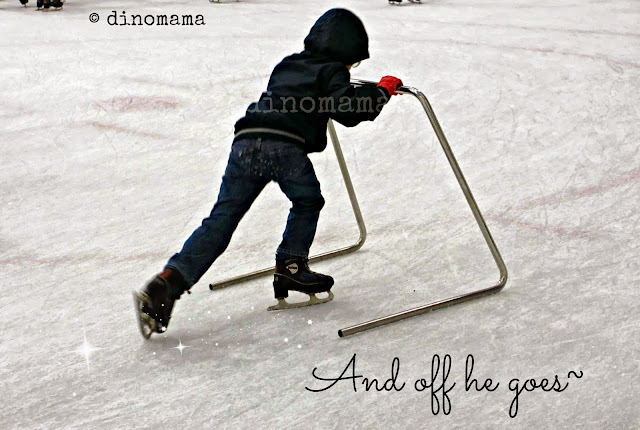 This little boy couldn't wait to get inside the ring, the minute he is on the ice he zips off by walking on the ice since he does not know how to skate. He went so many rounds around the ring till I lost count, clearly enjoying himself to the max. He went fast and furious, walking and gaining speed then gliding on the ice, feeling the thrill of it and the wind in his face. There are skating coach (or at least that's what I saw on their jackets) going around the ring helping the first timers or beginners but I guess its a skater's etiquette to help too by lending a helping hand to pull them up and giving words of encourage too. It warms my heart to see so many people are helping my little boy whenever he falls, asking if he is ok, helped him up and pushed him on again. This is because this mama does not skate, is scared of skating and falling and can do nothing to help her boy *hmmpphhh* My little feisty was not put off by all the falls, he simply picked himself up and zips off again. 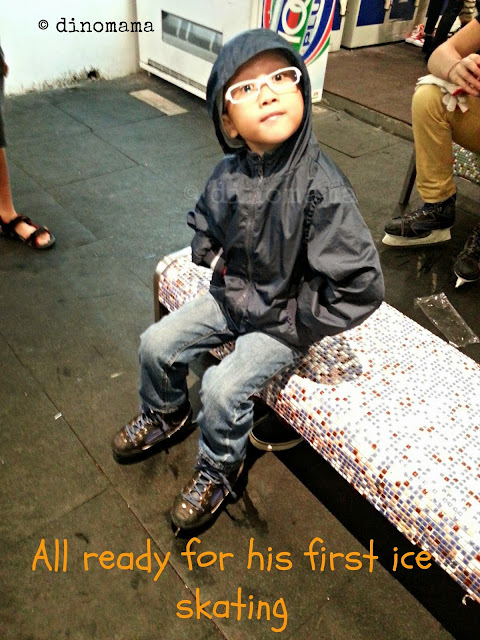 Here are a few photos of those helpful skaters, there are many more of them around. After 2 hours staying inside the icy cold place my fingers started to feel numb, luckily its time to leave much to the protest from the kids. DinoBoy came out of the ring with a thoroughly soaked through jeans, socks and wet jacket. He also have a big blister on his right small toe caused by the friction in the shoes, his socks are too thin to give any cushioned protection. I did not pack an extra clothes for him so I have to spend $21.90 to get a 2pc shorts from Mothercare, while changing the pants then I realized that his underwear is wet too~ *oops* Since its not soaked through I decided not to get new underwear for him. Our troupe proceeded the bowling alley 1 floor down for some bowling fun. The kids were thrilled, especially DinoBoy since its his first time playing with a real bowling ball in a real bowling alley. I managed to take a short instagram video of him throwing the ball, his reactions are priceless. It was a fun filled afternoon, we should do this more often! When we were home DinoBoy was still excited and filled DinoPapa with all the exciting things he did at the ice skating ring and the bowling alley. They even agree to go bowling this Saturday~ A Father & Son date! Woohoo! Additonal Charges - gloves @ $2.50 per pair, socks @ $2 per pair. 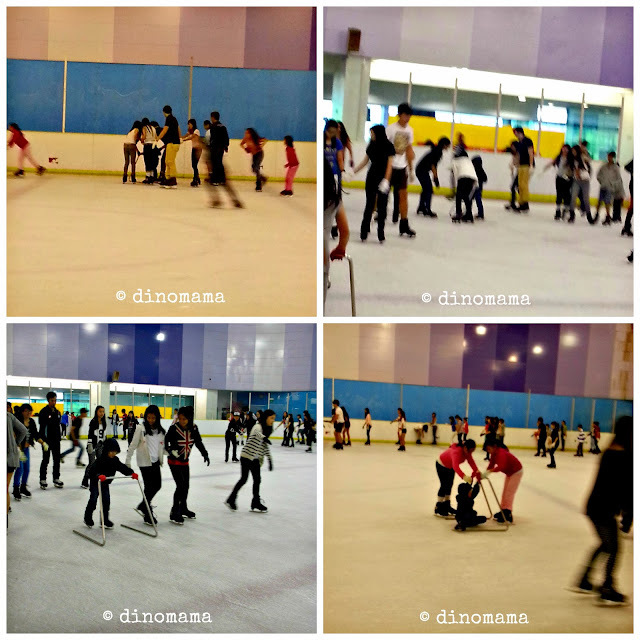 This mama does not ice skate OR bowl... so boring right? hahaha~ At least you bowl! Friendly bowling with the husband is a great bonding time. Looks like fun, Ice Skating was never my thing, did much better with the 4 wheels of skates under me, looks like everyone was having a wonderful time.